Now THIS is a great idea. Coffee shop owners, heads up, this will save you a bundle in law suits, not to mention keeping your customers happy, AND increasing your revenue via advertising: a lid that changes color to alert your customers that hot liquid is inside, slowly changing back to brown as the liquid cools, and also indicates when and if the lid is securely fastened. This is just too cool. 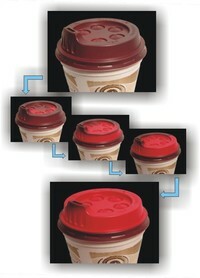 Smart Lid Systems, an Australian product development company, have commercialized the world's first color-changing single-use coffee cup lid. The "Smart" lid offers drastic advancements over currently available lids alerting consumers that the contents are hot by changing from a coffee brown color to a bright red when heat is applied. More importantly the lid indicates whether or not it is securely attached to the coffee cup, placing the store-owner at ease regarding safety concerns. Aimed at both high-volume users (large quickservice chains), and small independent cafes, this new lid has entered the market at the right time. Current consumption numbers for to-go beverages are above 50 billion per annum in America. Hot beverage consumption this winter will be a whole new experience and also allows a new medium to put logos and text on coffee lids, with messages appearing as the lid changes color. Advertisers now have the vehicle to take branding and advertising on disposable lids to the next level, allowing the large fast food chains to further enhance the purchase experience.